Plus! Learn to play Kings Of Leon, The Stone Roses, The Rolling Stones and more! 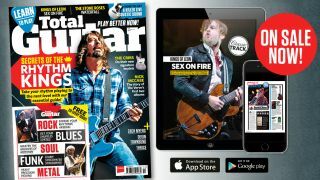 Total Guitar issue 285 is on sale in print and digitally worldwide from today. This month, we're getting locked in with guides to playing rhythm guitar like the masters! Our 10-page tutorial takes you through rock, funk, soul, blues and metal, and explains how to nail the tricks and techniques used by the best players in each style.